The question then arises regarding the quality of life of these patients. A typical end stage Amytrophic Lateral Sclerosis patient is not mobile at all. He lies in his bed or recliner, unable to lift his arm to reach for a tissue, unable to swallow food, unable to ask for a drink. He is completely dependent on his caretaker for every need. Yet his cognitive abilities remain intact or only mildly affected. He has an opinion on the president’s foreign policy, he is excited and proud when his grandson is made valedictorian of his high school graduating class, he thinks his wife’s new jacket is very becoming and he believes his brother should not accept the job offer in California. Feelings and thoughts boil inside of him and he can express none of it. Neither can he even express his request to turn the AC up or that he prefers to wear the blue shirt. This lack of ability to communicate can result in anxiety disorders and even mental illness. It is interesting to note that the eye muscles remain unaffected by ALS for a much longer period and it is this fact that has enabled the quality of life to be increased tremendously. Augmentative and Alternative Communication devices, when made available to the patient, can drastically improve his ability to communicate and restore his dignity as a functioning human being. The most simple of these devices is the phonetic board which enables the patient to choose letters that comprise a message to the caregiver. A blink of the eye will select the correct letter. This method, however, is cumbersome and slow. A more autonomous device uses the pupil of the eye to control a computer. Using infrared, the light reflected from the retina through the pupil is sensed by a specially designed optical sensor. The machine tracks the eye’s movements. In this way, the eye becomes a mouse with the sensor acting as cursor. A blink replaces the click. Using this method of gaze control, the patient can send an email and even go online or participate in social media. He can communicate with the world using only his eyes. Many devices are available and complex screening is needed in addition to training so that effective communication is in place when residual speech is no longer available to the patient. The journey will begin with the patient’s speech becoming somewhat unintelligible, the tumult of crowds will negatively affect otherwise comprehensible speech and the speaking rate gradually decreases. It is during this period that an optimally effective device will be chosen by a team of professionals, the caretaker and patient. The main burden of determining the correct device lies in the hands of the professionals. Several AAC strategies will be tried for periods to determine which works the best. The patient will then be trained so as to be ready when normal speech is no longer an option. Often patients do not want to consider AAC devices until the need arises. However, procrastinating is not to be advised as deterioration can be rapid with no proper preparation time available. When the ALS patient is referred for AAC assessment when the speaking rate approaches 125 words per minute (the norm is 190 wpm), proper monitoring can take place in a timely manner. Of great importance is the need for the patient to be fitted with AAC technology that will enable transition as the disease progresses. Eye-gaze devices may be the preferred device even when the patient still has other means of communication since eye movements are the least tiring and the most likely to remain when other abilities are defunct. 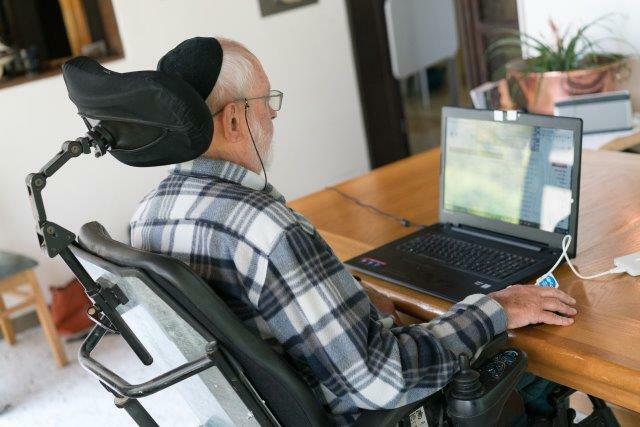 Computer training prior to the onset of the disease or for the facilitator is not vital to successful usage of AAC. The facilitators are almost all family members with non-technical backgrounds who receive an average of two hours instruction which they find to be adequate for their needs. The patients, even those with mild cognitive deficiencies, are able to successfully use both high and low tech devices. 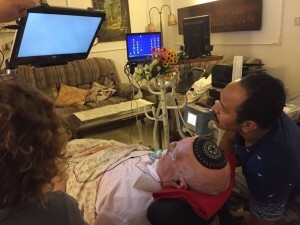 Always in the forefront of innovative solutions for the problems faced by ALS patients and others who are unable to speak, Ezer Mizion has put much effort into development of hi-tech methods of communication. In 2016, Ezer Mizion was chosen by Google for its project with Click2Speak, an Israeli start-up, to develop an on-screen eye-tracking operated keyboard that will enable people with high cognitive function and limited mobility to communicate and control their environment. The Click2Speak would facilitate communication with the best-in-class eye-tracking/mouse replacement software. With an affordable, multi-lingual, and easy-to-use on-screen keyboard, users with impaired motor skills and high cognitive ability can communicate easily and benefit from add-on features that enable them to control their environment. Click2Speak was founded in 2016 with the vision of revolutionizing the way individuals with severe physical impairments communicate. Focused on its vision to empower people through a new on-screen keyboard, Click2Speak works in close collaboration with end users and professionals to offer a cutting-edge augmentative alternative communication (AAC) tool. It all started in 2009 when Gal Sont, the driving force behind this inspiring project, was diagnosed with ALS (also known as Lou Gehrig’s disease). Gal held a Bachelor of Applied Science (B.A.Sc.) in Mathematics and Computer Science. He was involved in delivering complex solutions in growing technology organizations, as well as running and establishing the development activities and operations of several companies across international markets and brought years of extensive experience spearheading the development processes for robust software products in various fields such as E-Learning, social sports websites, online travel, and Big Data. Gal, loving husband and father to two young daughters, was diagnosed with ALS in 2009. Before Gal was diagnosed with the disease, he competed in off-road Enduro motorbike races, snowboarding, kite surfing, off road adventure – an adrenaline junkie! More recently his adrenaline rush came from a different source – he wanted to help disabled people in any way he can, starting by writing code that will improve their quality of life. Gal programed (mostly using his eyes due to his illness) the ultimate user-friendly, on-screen virtual keyboard for the benefit of disabled individuals who are cognitively competent but cannot use their voices for communicating or manage a manually operated keyboard. The Click2Speak keyboard is controlled by eye tracking and eye-operated communication and control system and features the world’s most advanced Swiftkey prediction engine which leverages its efficiency. Gal was unable to benefit long-term from the device he created as he passed away in the midst of its development. His efforts for Ezer Mizion, however, will be continued by the Ezer Mizion team and will enable so many to remain a vibrant part of their world in spite of their complete lack of the ability to speak. 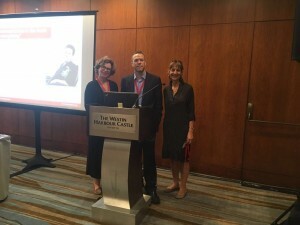 upgrade communication and therapy options by partnering in the development of communication technology and devices and to educating and influencing those in the professional communication field and end-users to tap in to the most updated AAC solutions. 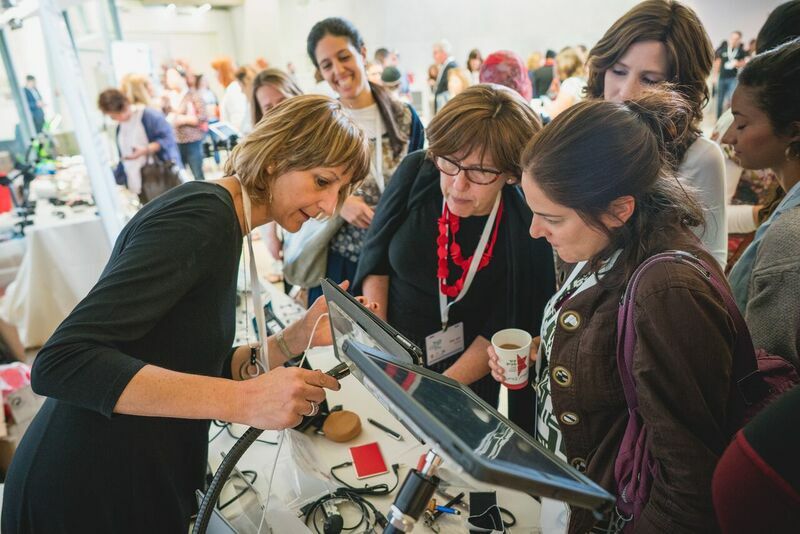 The Center collaborates with communication professionals in Israel and around the world like ISAAC (International Society for Augmentative and Alternative Communication), with solutions based on cutting edge technology. Its many projects include how-to training films available on-line teaching how to produce and use primary gestures for emerging AAC users. Another vital project is introducing AAC strategies into hospital Intensive Care Units. Every year, thousands of devices are loaned to children with special needs and adults with a range of communication impairments. Ezer Mizion’s AAC Division has been in existence since 1997 and has served more than 20,000 people and their families from all sectors of Israel’s population with the loan of state of the art medical equipment free of charge. In 2016, 100 devices were loaned to ALS patients including 25 computers with direct access, 13 computerized devices with head movement access and 28 eye-gaze systems. When a device has proven to be the perfect one for the patient’s needs, it can be purchased via the Israeli Government Health Package. Rachamim Melamed, an ALS patient, was recently provided with an advanced eye-gaze device by Ezer Mizion. Prior to his diagnosis, Mr. Melamed had been a highly acclaimed educator, philosopher and poet. Not much changed after his diagnosis. He continued writing and has produced eight books using only ‘the blink of an eye’. Rachamim had been told by his physicians that he had only two years to live. He and his family did not accept that diagnosis and utilized high tech life support systems to keep him not only alive but one of the most highly creative individuals in the country. One of his recent works is a book of art. Using the theme of the ‘eye’ in verses in the Bible, Rachamim, a religious Jew, created 33 textured pictures using the communication aids provided by Ezer Mizion, each one uniquely depicting one specific Biblical verse. Like to watch him in action? Click the link below and share his satisfaction as he continues to create using only the motion of his eyes and his many G-d-given talents. 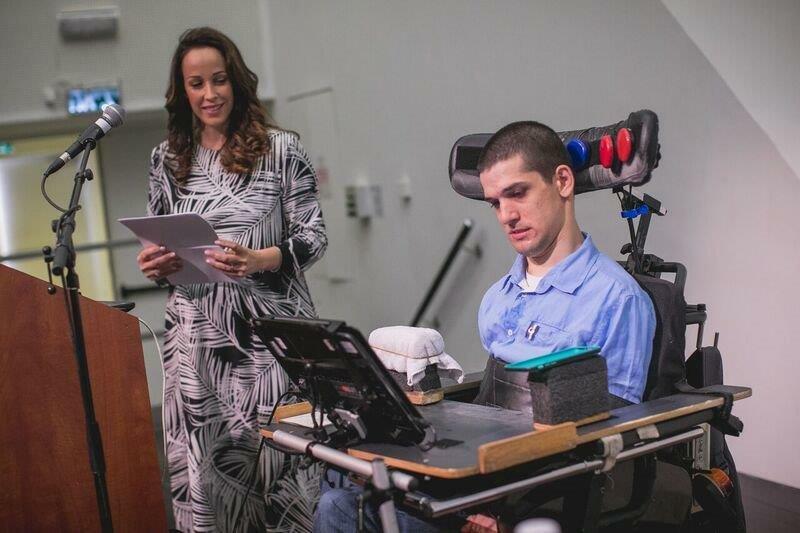 The sky’s the limit in technology these days and funding is the vehicle that will help us achieve more and more, enabling the ALS patient and others like him to communicate with the world around them. Please type AAC in the memo field and donate generously giving a voice to those who cannot speak!